River City Quilt Guild’s Spring Show starts tomorrow (June 13) and continues through June 15. Contact Cass ASAP if you have a quilt for the show. It’s at Central Baptist Academy, 7645 Winton Road, from 10 a.m. to 4 p.m. The Creative Festival in Sharonville is also June 13–15. Many different classes and speakers are scheduled on a variety of topics. 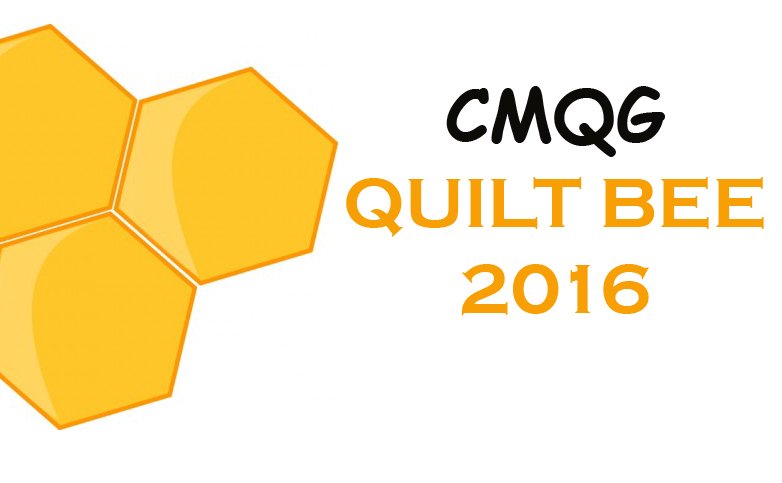 The Sew Original Quilt and Creative Expo is in Louisville, Kentucky, has invited our guild to show quilts. Kentucky does not have any modern quilt guilds, and Sew Original is so excited to have us there that they have offered us a free 10' × 10' booth. 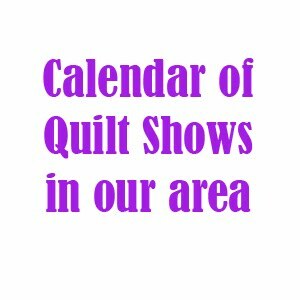 We can show our Dresden quilts, Ohio Star quilts, and any other quilts that we want to have in the show. They just want an approximate number of quilts to expect, so Jessica sent around a sign-up sheet. 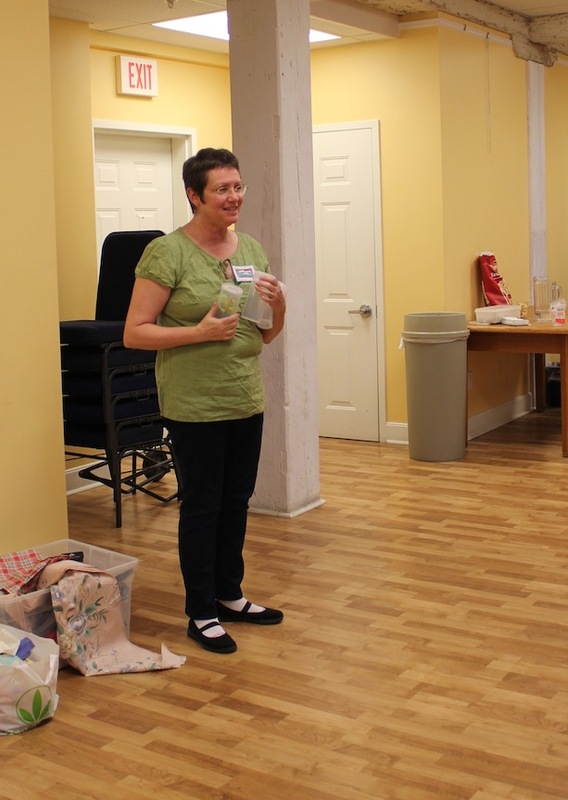 Please contact her ASAP (cincinnatimodernquiltguild@gmail.com) if you did not sign up but have quilts to send there. There are no size restrictions or requirements for our quilts, but they do need to have a hanging sleeve. We can bring our quilts there instead of sending them by mail, and this will help cut down on costs. They would like for us to help install the show and take it down too. The expo is August 31 and September 1. We also need people to help (wo)man our booth, so please contact Heather or Nancy for this or for any other information. The Shop Hop is on for July 13. We’ll be renting one or more 15-passenger vans, as needed, so please contact Kara Sanders if you have not already signed up. The cost is $10 for members and $15 for nonmembers. You can park your car at the Park & Ride lot across from Sewn Studio, then we’ll shop at Sewn, where Julie has offered a 20% discount to members. 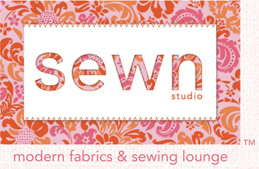 From there we’ll go to Lavender Street in Montgomery, and then on to Fabric Shack in Waynesville. Next happy hour is June 22 at Village Tavern in Montgomery. 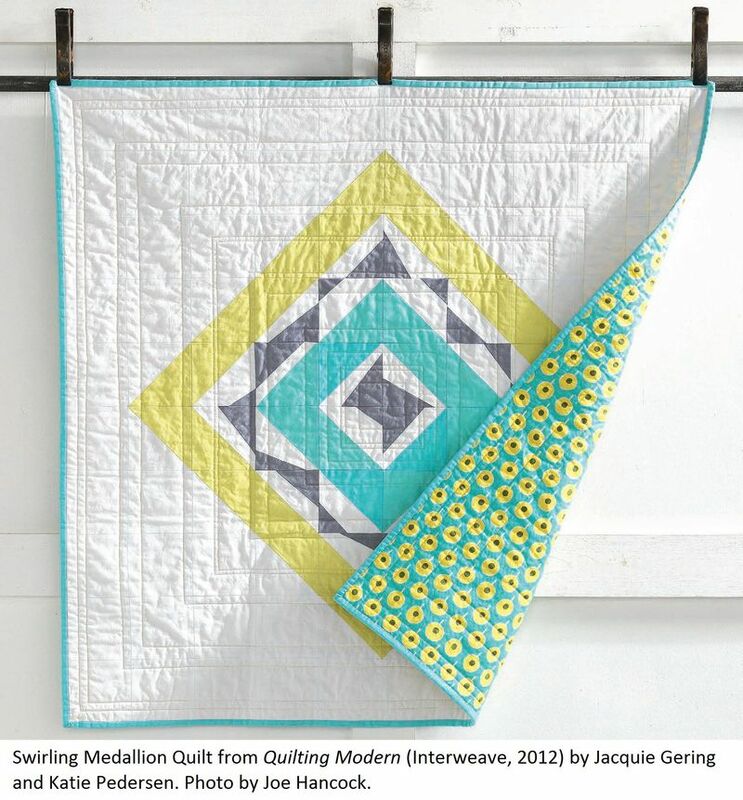 The American Quilter’s Society is sponsoring a Modern Quilt Challenge. You can enter any quilt made since January 2010. They are offering a total of $6,000 in prize money in 10 different categories. They need a full quilt photo, a detail shot, and a photo of the quiltmaker. Deadline is August 2. 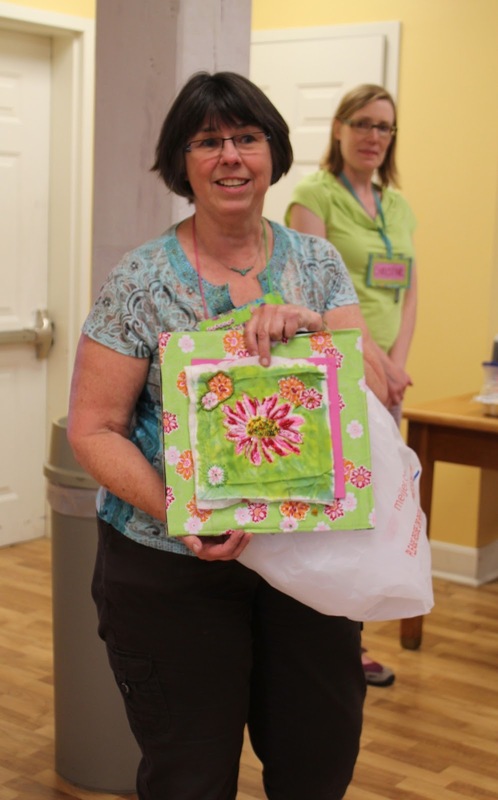 This is a great opportunity for modern quilters! Andie is working on a charity project with Quilts of Valor, who is having an anniversary this year and collecting blocks for a project. Details will be posted on the website. Please check back for details on how to contribute to this project. Our guild will be joining the national Modern Quilt Guild in July. If you have not yet paid dues for this year, please do so ASAP. We will get lots of benefits with joining the national guild, such as discounts, access to fabric for challenges, website organization benefits, and others. For a fundraiser for the extra dues, you can order your 31 Large Utility Tote and accessories from Kayla…who had baby Henry on Sunday! Congratulations, Kayla and family! F&W Media’s booklet for our Ohio Star quilts is on! Hurry! All quilts and pattern instructions will be due at our July meeting. Please contact Christine if you need any further information. This can be a great fundraiser for national dues. Another fundraiser idea is to sell some of our handmade items at the Centennial Barn's Fall Festival. Last year we made a decent amount of money this way, even with fewer members, so we’re hoping to make more this year with more members. Also, Oakley is starting its own version of City Flea. It runs June through September on the last Saturday of each month. Booth space is $50. If we have enough support for this, we could have a sale there in September. Our guild is looking for someone to help organize these two fundraisers for us and to price our items for sale. If you have experience in craft fairs and would like to do this, please contact Jessica. Vicki brought two quilts that she made years ago. Her Drunkard’s Path quilt was completely hand quilted with shadow quilting. It took her about a month to quilt. Her second quilt, a 9 patch in a 9 patch, is diagonally hand quilted. 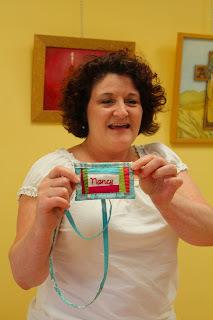 Nancy hand-pieced and hand-quilted a CMQG nametag. New member Peggy made a small wall-art quilt with a machine-pieced heart that she hand appliquéd onto the quilt top. She also did the binding by hand by folding the quilt top to the back and using long, uneven stab stitches for a great improv look! Cass brought a quilt that she made in 1983, even before the days of rotary cutters. It’s entirely hand pieced and hand quilted using the quilt-as-you-go method. She also showed a block left over from a double wedding ring quilt that she made completely by hand as a gift years ago. Carolyn brought a hand-embroidered piece that she will add to another hand embroidered piece she did. Next month’s swap is a scrap bag swap. Scraps must be at least 2.5" square. Bring your scraps in a zip-top plastic bag, and we’ll divvy them up and then redistribute. This is a great way to get a variety of scraps. Remember that we are a modern quilt guild and therefore would like to limit this swap to scraps of modern fabrics. Kathy made a beautiful queen-size Flying Geese quilt from Denyse Schmidt's quilt pattern Point Me using Denyse’s Flea Market Fancy fabric line. Janine did the quilting on this quilt. Amanda brought her finished T-shirt quilt! Michelle made an upcycled project from some of her husband’s favorite clothes that he just couldn’t part with…but needed to. It was a gift to him for his birthday. Now he’ll enjoy these clothes in another form, like it or not! Gillian made yet another awesome baby quilt using a Butterfly Block tutorial from Red Pepper Quilts. She also made a #StLouis16patch quilt with 4" blocks using stacking and strip piecing. Jessica did a Flickr pillow swap. She sent her pillow to England and got a beautiful pillow that she just loves, from England also, from Kettleboiler quilter Moira. 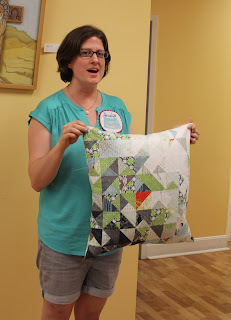 She also made a mini quilt from scraps using a center star from Elizabeth Hartman’s first book. Jill Montgomery brought her forgotten quilt. It’s been in Barb’s house for staging, and Jill completely forgot about it. Barb’s house is now sold (yeah! ), and now Jill has her forgotten quilt back. Education: Our Very Own Heather Jones! 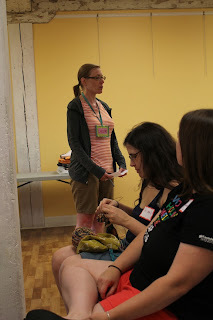 Heather shared with us her presentation that she did at QuiltCon, with a few added tidbits just for us, Everyday Inspiration in Modern Quilts. Heather did not grow up in a quilting family, except for her great aunt Ollie, who made a pink and white hand-pieced quilt for Heather when Aunt Ollie was in her 80s and Heather was a baby. In high school Heather was voted Most Artistic, and her first love has always been fine arts. 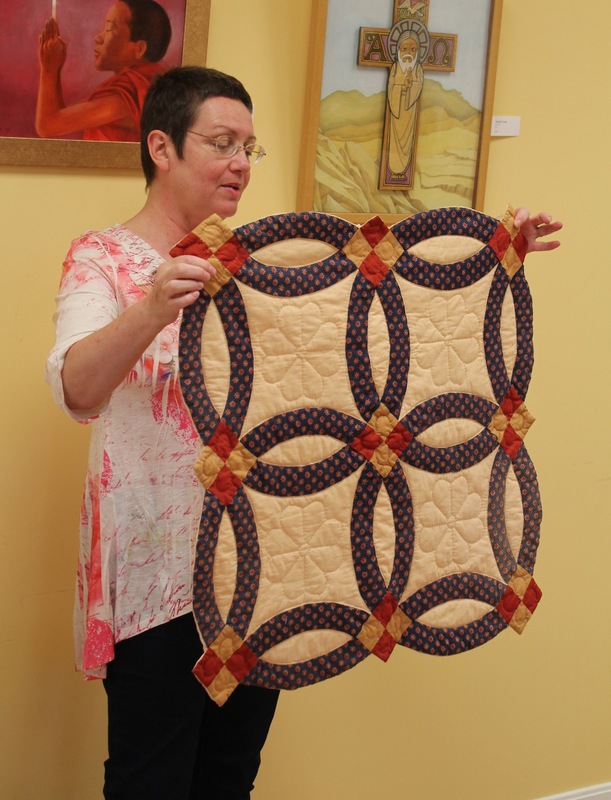 She has a bachelor’s degree in art history and has taken a lot of other art classes, so her approach to quilting is from a perspective of fine arts. She wants her work to be her own and not look like someone else’s. She is inspired by everyday things, everyday people, everyday places, every day. Heather’s quilt design tools: iPhone and sketch book. She works her calculations using grid paper. A Yield sign painted on a Walmart parking lot was her inspiration for a winning Project Modern quilt, Yield, judged by Valori Wells. 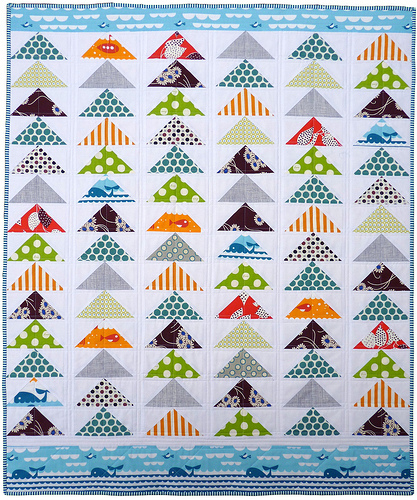 She uses a lot of solids, and one reason is that the design from a print doesn’t compete with the design in her quilt. For the same reason, she quilts straight lines a lot. Josef Albers’ book The Interaction of Color and his art series Homage to the Square are her inspiration for her monochromatic Anni quilt and for her mini quilt Four Square and also Homage. A few Railroad Crossing signs were the inspiration for an improv mini cross quilt and her Cross Ties quilt. 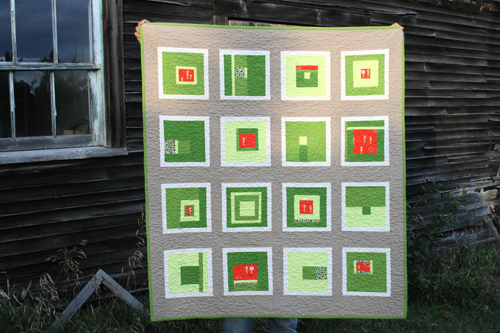 A barn silo was the inspiration for her Silo quilt, which won another Project Modern contest that was judged by Denyse Schmidt. It is not an exact duplication of what she saw, but an interpretation of it, where she tried to capture the linear aspects that inspired her from the silo. Her pillow on the cover of Modern Patchwork magazine was inspired by a bullseye corner trim piece in her Victorian home. Heather’s parting thoughts: Be aware of your surroundings, always have your camera ready, and be ready for inspiration anywhere. View Heather’s classes, Mod Stripes Quilt Top and Diamonds in the Sky, and trailer on the Creativebug website and her QuiltCon lecture on the Craftsy website. Our next meeting is Wednesday, July 10, 2013 from 7-9 pm at the Centennial Barn.